I majored in Home Economics at Baylor University and graduated in 1957 with a Bachelor of Science degree so the opportunity to talk about foods, kitchens, and appliances is a natural for me. The place of food in our diets began in the Garden of Eden when Adam and Eve had their pick of fruits and vegetables that grew in abundance. Before the invention of fire, man consumed raw foods that he hunted and killed. Archeologists have found charred wood and seeds in Israel that date back 790,000 years. So even though the exact date of the discovery of fire isn’t known, evidence of its use goes back a long way. That discovery changed man’s way of life and his dietary habits. Those changes continue to evolve today with new methods of cooking, new health guidelines, and new recipes for the bounty of food we have. One important note is that not all foods are found in all countries. America has been able to reproduce most of the foods from other nations, but many are still imported. Foods native to our own land are corn, beans, and squash that were staples in most Indian diets. Explorers discovered that Indians were as diverse as the cultures in Europe and Asia and lived on one continent. Their languages and rituals as well as their diets varied from region to region. As they explored, they found the Indians of the northwest coast areas of what is now Oregon and Washington had a diet of fish and traded that fish for the seeds and fruits from the lower, more fertile regions of the lower west coast. Back then, the food had to be planted, grown, harvested and then cooked. Animals had to be grown, slaughtered, preserved, and then cooked. Although we still have farming and ranching today and a bountiful supply of fruits and vegetables at the supermarkets and from Farmer’s Markets, many of us rely on the freezer for meals that can be zapped in the microwave oven for a minute or so. I am one of those who still love to cook and have an extensive collection of cookbooks. Still, I find myself using convenience foods when I’m in a hurry. I would imagine that most of you do too. Starting with a recipe and fresh ingredients to create a cake, casserole, pastry, cookie, or other dessert can be rewarding, but we still have modern appliances to make our job easier. Imagine trying to cook some of your favorite recipes over an open fire. No ovens, no stove tops, no fireplaces or big iron kettles, all you had were sticks and whatever utensils could be carved and could withstand fire or heat. 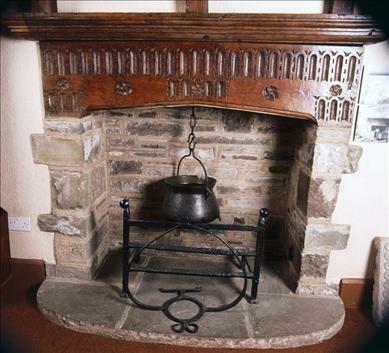 Even as stoves were invented and developed, they had none of the “bells and whistles” of our modern day stoves. The early settlers used open fireplaces to prepare their meals and worked hard to have food for the table. Soups and stews as well as many vegetables were cooked in iron pots over open flames. Baking was done over the flames as well in cast iron pan that could be covered. The fireplace was the main focus of the home as it was usually the only source of heat for winter. The kitchen became the hub of the home with meals served there as well as studying, reading, and family time around the kitchen table. Of course wealthier families had servants to take care of the cooking for them and separate rooms for the kitchen evolved. Down south, the kitchens were in a separate building either just outside the back of the house or to the side. As the kitchens grew in size, so did the meals and types of food served from the simple suppers of the prairie home to the elaborate dinners of the southern plantation home. As the years went by, inventors dabbled in all types of inventions to make life easier. In 1740, a Franklin stove came into use, but still used wood as its source of fuel. Food could be cooked in pot on top instead of dangling over the fire. In the 19th century when wagon trains traveled west, once again travelers cooked over open fires as people sat around the campfires and ate. Mealtime was a time of fellowship as well as a time of fueling the body. All through the 19th century, and into the 20th, new and better methods of cooking entered the home. Some replaced wood with coal and then gas came along. Gas powered stoves are in use today as well even though electricity came along and gave us the modern electric range. The convection oven gave us more options and then the microwave oven came on the scene and our methods of cooking changed even more. Gas stoves are still the best to have when the electricity goes out in a storm and all other cooking appliances don't work. When I met my husband, he worked for a gas utility company and I worked for an electric one. When we built our first home and installed built-in oven and surface units, I chose to have electric ovens and gas surface top. That way, I'd always have a way to cook. Sure came in handy during a number of hurricane strikes along the upper Texas coast. I hope this little foray into the past makes you glad to have all the modern conveniences now available for preparing meals for our families. 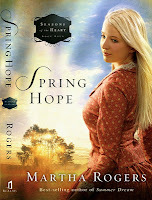 Martha’s book credits include two four book historical series, Winds Across the Prairie, published in 2010 and 2011, and Seasons of the Heart, in 2011 and 2012 as well as Christmas at Holly Hill in 2012. A new series is scheduled for 2013 all with Realms of Charisma media. Martha is also one of nine authors in the Bloomfield series published by B&H. 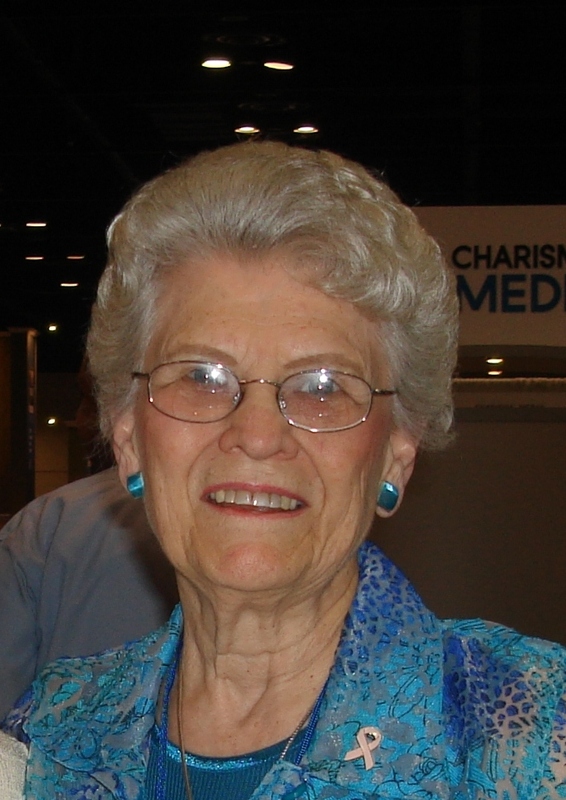 Martha and her husband live in Houston, Texas where they are active members of First Baptist Church. Be sure to leave email address with your comment to be in the drawing for a copy of my book, Spring Hope. Libby Cantrell’s life has gone from bad to worse since her mother’s death. As a deputy, Cory Muldoon sees it as his duty to find out the truth about her even as he is attracted to her. Will he be able to accept her as she is now and truly forget and forgive her sordid past? Don’t forget to leave a comment to be in our daily giveaways! For each day you comment on CFHS, you’ll receive one entry in the Kindle and one in the $25 Amazon gift card giveaway. Comment on every post in the month of March and earn 31 entries! Hello Martha! Great post...I am definitely grateful for modern conveniences. While my children were growing up, I used all the quick meals tactics I could find. But, now that it's just me and my husband, I want to start and try new recipes. Thankfully, I have more than just a pot over an open fire to cook with...God bless. I enjoyed reading your article about cooking over an open fire. I'm afraid my poor family would starve to death because I'm sure I would burn everything in sight. I would love to win a copy of your book, "Spring Hope". Great post and very interesting. Thanks for sharing! I am so very thankful for our modern conveniences. I can't imagine baking in a cast iron pan over an open flame. Thanks for a chance to win Spring Hope. You're so right, Bethany. When Ike hit us and we were without electricity for five days, we cooked on our gas stove top, but we also cooked a lot on our grill and our camp stove outdoors. A charcoal or propane powered grill come in quite handy during power outages. The hardest part was getting enough ice to keep foods cold. Makes me wonder how the settlers managed with only coming to town once a week or even every other week for supplies. Interesting article re: the evolution of cooking - I wouldn't have enjoyed cooking/baking near as much as I do now, had I lived in the pre-modern convenience appliance era. Thanks for the opportunity to win a book! Fascinating post about ole time cookin' techniques. :) Thanks for sharing! Hello Martha, thank you for the interesting post and reminder of how much easier it is to cook today. I do enjoy a few convenience foods, but mostly I cook from scratch. I used to have hundreds of cookbooks, but have pared down to a much smaller number. The internet is so handy for looking up recipes. I would love to win a copy of your book. Sounds like a good book, thank you for the chance to win it. I like the cover! I think I've only read one of your books martha, would love the opportunity to win this one! Great post Martha with some great little nuggets of history included. And your bookcover is gorgeous! I don't know that I could handle cooking way back when - with what they had! I like my convenience appliances. I can't imagine cooking over an open fire although we got close the year that three hurricanes came through out town. We used a propane burner and cooked everything on it. It does take some getting used to. I'm very thankful for our modern appliances. I've never tried cooking over an open fire (I don't enjoy camping). It would be fun to win Martha's new book.I haven't yet read any of her books. I agree...I need a stove!!! Interesting post, Martha. I love writing about the 19th century, but I don't think I'd like living there so much. I'd miss my modern conveniences, especially my ice maker and laptop. I think I'd also get bored with the limited variety of food. Ahem, excuse me while I go eat a piece of chocolate. Well, Vickie, at least they had chocolate in the latter half of the century. Now that would make an interesting blog. One thing we have to remember is that if we lived back then, we wouldn't know about modern conveniences so we wouldn't miss them. Might daydream about someone inventing some of them, but I don't think they ever could have imagined what we have today. So good to hear from a fellow Home Economics grad...(82, Ok St U)! I had the opportunity to serve 20 yrs as a pastors wife (also so bapt) before being called to the mission field of Mexico and Nicaragua. Everything I learned about the food groups and cleansiness went out the window! When I tell them I teach cooking and sewing they laugh, since my tortillas aren't perfectly shaped by hand. When in the states we are only 6 hrs from you, in Donna, Tx. Would love to read your book! I have to laugh when I go back to Baylor and the Home Ec Department is knows as Consumer Sciences and Human Relationships or something to that effect. We've been on mission trips to Mexico and oh my, what I learned there. So thankful for our more sanitary conditions here in the US. I agree on the name change, regardless of what they call it...and we were FHA, not FCCLA! I wrote a cookbook which included funny stories from our ministry and life in general, & You're a Preachers Wife? Check it out on Facebook. It was nice meeting you! This post reminds me of a book that I recently read about dutch ovens. Thank goodness we have ovens. I don't think I would be equipped to cook over open fire. This book sounds great. Thanks for having the giveaway. Thank you for a chance to win one of your books, as I haven't yet read one yet!! Congratulations to Patty. You are the winner of Spring Hope. Go to my website and click on Contact Me, and send me your mailing address. Loved this post! I still remember when I proudly announced at dinner that I'd made homemade bread at which my Grandmother replied that using a breadmaker machine was for lazy women! HAHA! I can't even imagine how many loaves of bread or pies she had made from scratch! Thanks for the interesting post. Modern conveniences are often taken for granted. We didn't experience many power outages while we lived in Texas. Colorado is a different experience all together. After our first winter here, we made some adjustments to our all electric home so we could cook, have drinking water, and bathe when the power goes out. I enjoy your love of cooking showing up in your books. I tried the recipe you included on a card when you signed your story "Not on the Menu" in the "Sugar and Grits"novela. Dottie Jean's Pecan Pie was a hit with my "Pucon" pie loving husband. How wonderful to hear that he liked the pie. It was my grandmother's recipe and we had it every Christmas. It's a tradition for our family Christmas even today. My new series and blog about Bloomfield will have recipes from the Pink Geranium Tea Room included in them. Thanks for stopping by. My grandparents have one of those stoves. It does not work but it looks cool. What a lovely post. I can almost smell the fire burning. Our friend lives in a very old house and has a hearth stove in the living room. He uses it for heat only though. I must admit I am glad that we have electricity and gas to cook today. We use our wood stove which I love instead of the heating/ac we had installed when we moved to our Missouri home four years ago. There were gas heaters on the wall and the stovepipe for a wood stove. We cook with cast iron and I prefer my gas stove. I can tell by the height of the flame, where I want it. I also have an abundance of cookbooks, mainly community ones. Good reading material too. I cook from scratch and my husband has a steady supply of raw veggies he likes for his lunch. S'mores are yummy over the coals before adding more wood! Kathleen, I do hope you come back often on the 11th of each month to learn more about cooking in the past. I love to cook and I have done a fare share of camping, I know how to cook on a camp fire and feed a dozen or so, I'm a true believer we do what we need to, to take care of our families. Family and church were and are very important their support and help are important in all era's. Thanks for the giveaway!